This is a GREAT brow palette--mix the two brow powders for the shade you need. Use the wax to groom brows (brush upward and outward for a "wide-awake," "big-eyed" look). I love the tiny tweezers which come with the palette (you never know when you need them) and the stiff-bristled brush. This kit is amazing, and super inexpensive! It has a great mirror, the tweezers are actually very useful, the two shades of brow powder are great, as is the wax, and the little slanted brush is very good at applying powder (although it is VERY small). I've switched from more expensive brow powders to this one because it's just better. The only thing I don't like is that the plastic clasp closure broke and so it won't stay closed. But I will absolutely repurchase this! Love it, Especially for the Price! 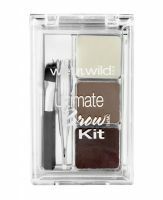 Seriously, for the price, this brow kit can't be beat! The powders have a great formulation, are well pigmented, and can be easily brushed out to a more natural finish after I apply it to my brows. The two color combination are perfectly matched for easy shading, ombre-ing, or mixing of colors to find my perfect shade. They do tend to kick up a lot of excess powder though, which sometimes travel i...read morento the wax if I decide to take the kit with me on the go. And as if this product doesn't do enough for me, neither the wax nor the powders break me out around my eyebrows like some brow products have done! My only complaint involves the wax and the packaging itself. The wax has a great emollient texture that isn't had to get a brush into, but that also creates the problem of actually applying it to my brows. It seems that the wax just doesn't want to be picked up by my brush, rather, it just sort of pushes it around the pan. Using the brush included in the kit does help a little because of its stiff bristles, but it also creates the problem of contaminating the wax with whatever color I happen to pick up with the brush when I filled in my brows. The brush is the more useful of the tools included, where the tweezers are not precise enough to pluck any hairs with. Mostly, the two just get in the way when I try to close the lid. The mirror, too, can be hard to open because it's located on the underside of the packaging rather than in the lid. It often is stuck by the sticker on the back, and require some serious wiggling and tugging to open if you want to use it. I also find that some excess powder gets into the mirror compartment and smear up the mirror, making it hard to clean. Overall, it still is a great product that make a lot of things a lot easier by containing so much in such a little package! I highly recommend to those looking for an inexpensive brow kit and replacing the tweezers and brush inside if necessary!